The God-given burden for our school�s mission is to �Provide a Quality Christian, Values-based Education for the children of Davao City� In carrying out this work, a unique blend of MISSION (purpose) & MINISTRY (meeting spiritual needs of the community) has materialized. We�re sharing the love of Jesus through weddings, prayer, fellowship & discipleship. Now, a school year has begun! Last month we laid-off some of last year�s staff. On their last day, they were given despidida (going away) party by parents of the sponsored kids, thanking them for helping grow spiritually. The teachers also took those who were leaving to the beach at Babak on nearby Samal Island. After their picnic were the required summer government teacher training seminars of Makabayan & BEC. The staff then got busy preparing their classroom decorations, including those for the new science lab, complete with freshly built tables & chairs. They checked the stock of books for our new school year: counting notebooks, pencils & other school supplies for the Sponsored Kids. Then on to buy cloth for the school uniforms that the seamstress ordered. Finally, they submitted final last-minute paperwork for the upcoming renewal of our business permits. During this time 2 parents with their adult children came to the office conferring about their desire to have their kids to be wedded in the church/school. 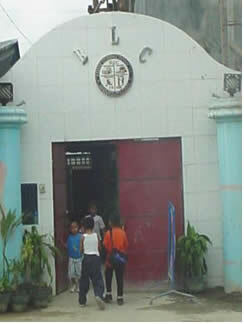 The families had transferred to Davao City from Monte Vista & joined the Quibuloy cult. Now they were discouraged on how that group treated their members. They expressed their desire to worship with us in Laverna Hills. 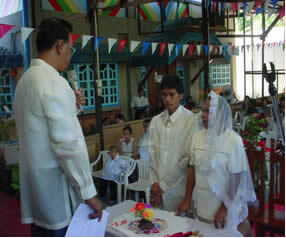 On June 5 our OIC Dr. Ayoc solemnized the wedding of Roy & Sarah. Pastor Ezer gave them a seminar on husband/wife relationships & emphasized their relationship with Jesus. They now attend our church! Parents of many sponsored children are now requesting extra 1-on-1 Bible studies, in both AM/PM & on weekends after church, keeping everybody hopping and active! After Roy/Sarah�s wedding, 5 were baptized: Roem, (1st gd teacher�s husband), Jacqueline (4th gd teacher�s daughter), Lyn-lyn, Jenie (parents of sponsored kids) & Maricel (wife of one of the construction workers for our new Elementary building). We will be losing our assistant secretary, Nimfa (the mother of Rapunzel). She was diagnosed with severe myoma & her stomach is getting bigger as if she were five months pregnant. She cannot report regularly to the school anymore, & needs her rest. She�s constantly crying since she's starting to feel the pain in her abdomen. Thanks for your prayers for her complete recovery. Ministry and mission: we�re a team! 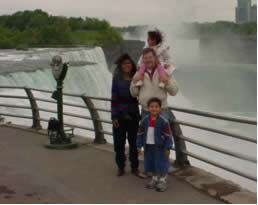 I just wanted to let you two know that Jeff & I were very encouraged by your visit.. I was especially impressed by your fervor and enthusiasm in serving the Lord and doing His work in His strength and not your own. I was challenged to get closer to God in prayer. I have been realizing that I often do much more complaining than I do praying, and that is not good. Thank you for sharing with the church and giving the missions challenge. I feel that many people think there is not a ministry for them, but that ministry is for people who are pastors and missionaries, but there are a lot of jobs to fill-in in between. When you pray for our church, could you please pray that God would help those in our church to find a place/ministry to plug in their gifts so that they are not neglected? I am thankful to be a missionary candidate and be serving in a church where visiting missionaries pass through. It is such a HUGE encouragement to find people with a similar calling and to learn from their (your) experiences. Sometimes I get discouraged because we are not overseas yet, but I do realize that God is using this time to sharpen us and prepare us for the next step. Thanks for helping me remember these things. It is an honor to pray for you and your ministry when we see the things that God has done. Be blessed as you finish your furlough. Can�t wait to see you. I just came upon 2 forensic microscopes. They were donated but we have no use for them. The plan was to let the auxiliary sell them at a yard sale, but I decided to buy them instead for the boys. Frankly, they are pretty neat, but we don't need them. So I asked if the auxiliary would give them to me for your school & they eagerly agreed. What�re the chances that we would get such a donation 2 weeks before your newsletter petitioned for them? WEDDINGS, BAPTISMS, DEDICATIONS AND FUNERALS ARE ALL PART OF THE VARIED MINISTRIES OF BLC.